Wren. What am I looking for? Fox was not on my mind when I settled down to explore Wren. She pulled herself out of Braken hidden from the biting north wind. She may have stayed all day had I not chosen this spot to improve on last week’s ability to see Wren. Disdainful look over her shoulder, I knew my place. Wren moved, well Braken moved like Michael Benteen’s Potty Time, but Wren did not show. Then a whirr of wings. A cocked brown tail; pale supercilium; pointy beak; bright beady eye; then nothing. Deep undercover it called leading to a burst of song from behind me. Then it was just Braken again. Knowing Wren is going to be more time consuming than I originally thought. I was in town later and on a whim I went to see what modern nature writers were saying about Wren. The Complete Book of Garden birds, with David Daley’s lovely water colours, devotes as much space to Wren as it does to Hawfinch. This parity is not mirrored I suspect by most birders with the current influx of hundreds of Hawfinches to the country. After that other writers expressed Wren as a tut-tutter, unmistakeable and a list padder. Repetition of the volume of song from such a small bird began to bore me. Why has all the observant creative writing been lost to repeating things others have already said. No wonder children are not engaged. I turned to go and at the top of the stairs was a copy of Macfarlane and Morris’s Lost Words. Having seen Wren being painted and spoken, would the book live up to expectations. These are spells to engage children with things we are losing. Important things and Wren is there as its own page and hidden amongst the other leaves too. This is what I am searching for. 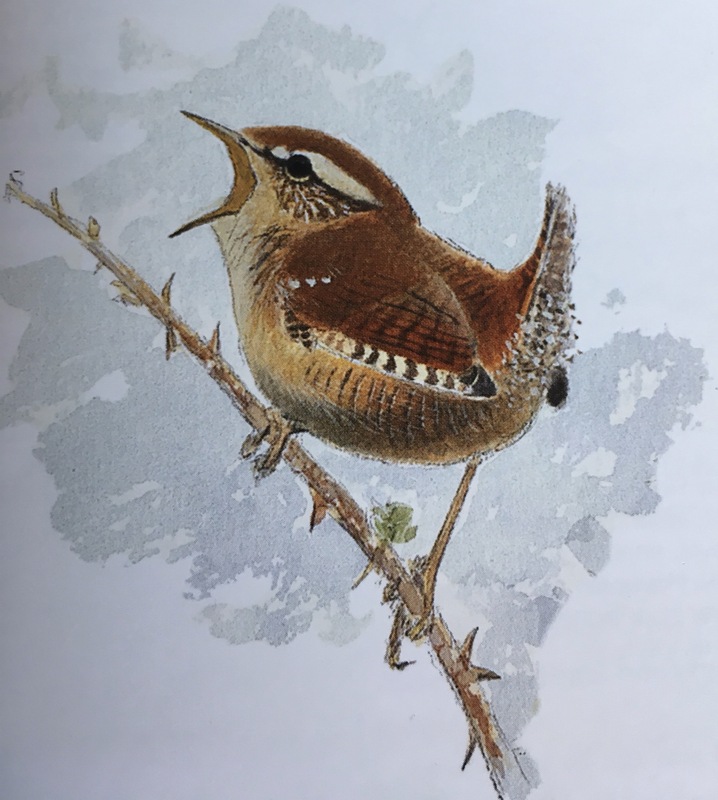 Wren, an active verb as well as a hidden noun. Here was the project. Why? may be a different question. The facts may already be known, but not to me. At 9 grams it is the weight of a £1 coin. How has it successfully covered the Northern Hemisphere?